Work on two new cairns to guide walkers and climbers on Britain’s highest mountain has been completed. The John Muir Trust consulted the public on the two new structures, which mark the descent point into Coire Lies and the top of Number Four Gully on Ben Nevis’s North Face. 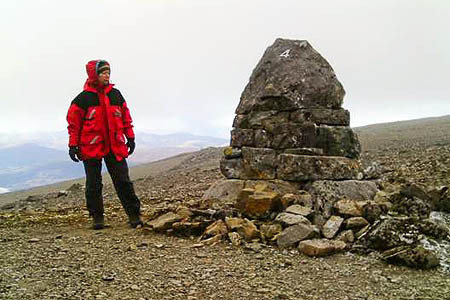 The building of the two cairns follows the removal by the trust, which owns most of the summit of the mountain, of series of abseil posts and the two old markers which the new cairns have replaced. The old Number Four Gully marker had been vandalised. 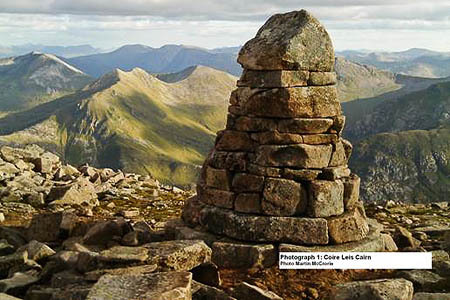 The charity said the new Coire Leis cairn is about 2m high and has a large, distinct capstone. It serves as a navigation marker for people descending from the bealach at the south-western end of the Carn Mòr Dearg Arête into Coire Leis and is at NN 171 710. The Number Four Gully marker is a cairn 1.7m high, which again has a distinctive capstone and is marked with the two aluminium number fours on its southern and north-eastern side. The cairn has been built at the same place, NN 159 717, where the old, vandalised marker was situated. The John Muir trust also appealed to visitors to the summit plateau of the 1,344m (4,409ft) mountain to take care not to disturb rare plants that have established themselves in the base of the old cairn, which has been left in place. Two species of Starwort Mouse-ear, Cerastium ceratoides and Cerastium articum are growing in the stonework and should not be disturbed, the JMT said.